I came home from my family visit this year with something I've wanted for a long time. Exciting huh? 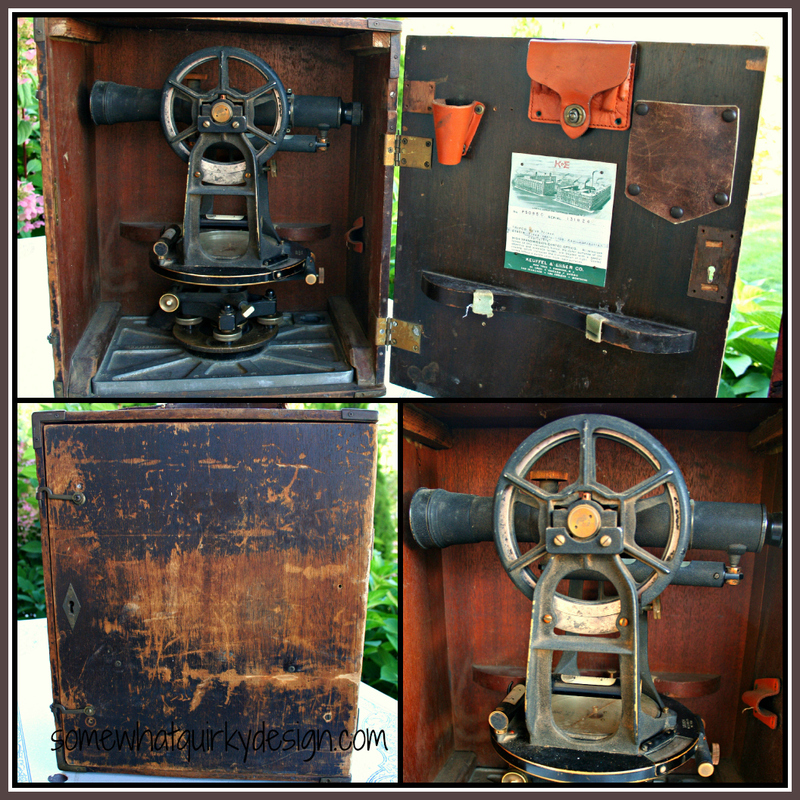 Haven't you always wanted a Theodolite Transit by Keuffel & Esser! How about now? Does the tri-pod help? These are some of my father's old engineering and land surveying tools. These slide rules were completely fascinating to me when I was a little girl. I am still completely clueless how to use one but it means a lot to me to have them. These tools are pretty archaic now, but they represent my father's life work and passion. He had a whole drawer full of these framed certificates and licenses but I opted for these 4. I figured they were enough. I'm not sure what I will do with any of it - probably put it away until I redo our office and incorporate it all there. I think it is fairly obvious that I should make a floor lamp with the tripod. 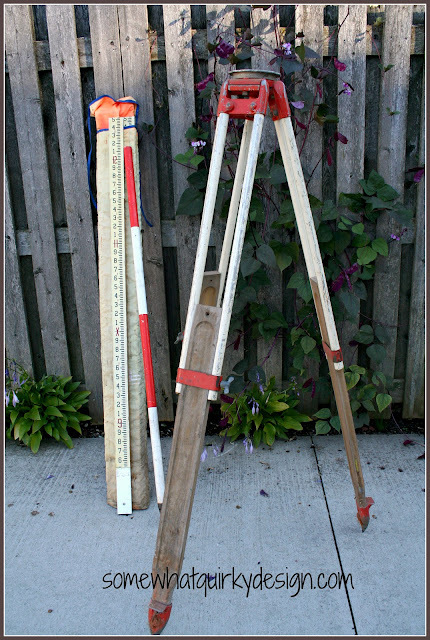 It would be nice if it was 100% wood instead of 50%, but research indicates that if he would have to be about 130 years old right now to have used a totally wooden tripod. That would make me about 104 (or dead)! He didn't do a lot of surveying in the last 40 years, or he would probably have used more modern equipment. But where's the charm in that? I'm trying to decide whether or not to refinish the box. All that wear represents a lot of work. What do you think? Should I leave the box like it is or refurbish it some? Wow, that is such cool stuff and it carries your family history. Amazing. The box has a certain cool factor to it, but maybe just clean it a bit or something so it doesn't loose all it's character. As for the mosquito remedies...the dryer sheets did not work in the least. I sat and covered my ankles with one and kept the other by neck and still the taunting mosquito harassed me. I sat there waving it around my head while trying to keep the one over my ankles as I stretched out on the couch. Hardly restful. I gave it up real quick. :( I could definitely have saved time and bought some Skin So Soft or even just some OFF! Ah well, where's the fun in that? Hmmm... then again where's the fun in itching and swatting mosquitoes! And if he was 130 that would make you how old? 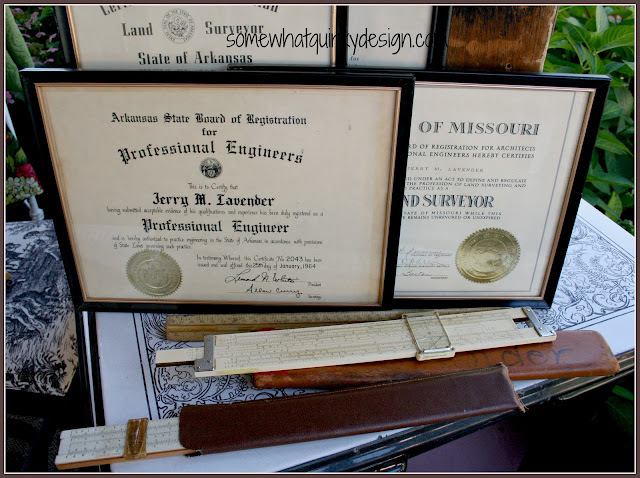 My Dad was an engineer with NASA and used to design airplanes with a slide rule. Just amazing to me. He tried to teach my son how to use it, but I'm not sure how much my son actually "got it". My Dad died a year ago and we all wanted that slide rule in that cool leather case. Not sure which sibling ended up with it, but wherever it ended up, it is cherished. I would not even clean the ox unless it's sticky, then maybe, very carefully. This is a fabulous collection and you are so lucky to have this collection.